The daughter of former Manchester City player, Antoine Sibierski, has been found hanged - a day after being arrested on suspicion of assault. Sibylle Sibierski, 18, was discovered by police at a flat in Altrincham after they forced the door open on Monday. She was questioned on Sunday over an allegation she assaulted her boyfriend, but was released without charge. Greater Manchester Police confirmed the Independent Police Complaints Commission (IPPC) had been informed. There were no suspicious circumstances surrounding her death, police added. 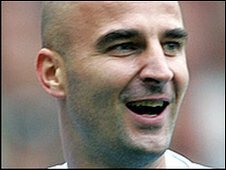 French centre forward Sibierski, 35, moved to Manchester City from Lens in 2003 and made 92 league appearances before he went on to play for Newcastle United and Wigan Athletic. He has now retired from playing. On her Facebook page, Miss Sibierski's last wall posting in the early hours of Saturday read: "had a very good evening, Heart&Soul was good and i love A. very, very much." The former pupil of St Bede's College and Cheadle & Marple Sixth Form College described herself on her social networking site page as "Cute, lovely, nice, naughty, cheeky, love my friends, love my family and in love with an amazing guy". More than 500 people have paid tribute to the 18-year-old on social networking site, Facebook. 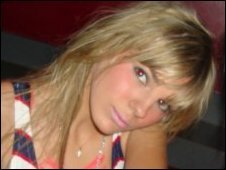 She is thought to have been working recently as a promoter at the Lounge 31 nightclub in Manchester city centre.